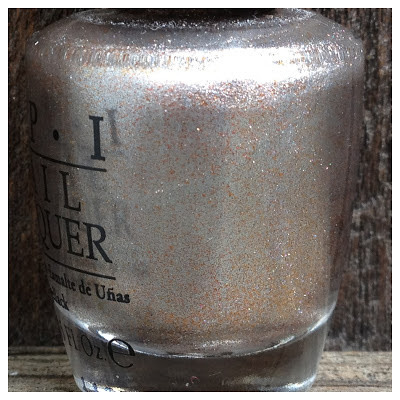 What I Blog About When I Blog About Books: NOTD: OPI "Designer...De Better!" Today's notd is for OPI's "Designer...De Better!" This polish was released in the Muppets Holiday collection in 2011. It's a silver with bronze flecks. Sounds strange, doesn't it? This polish is definitely a unique one. I recommend enlarging the photo below to get a good look at all the little flecks of orange-y bronze. In theory, the combination is completely odd, but I adore how it looks on my hands. This polish has such a beautiful foil/glass-y finish that makes it stand out so much. I don't normally gravitate towards silver polishes as much, but the finish just makes it that much better, and surprisingly, I like the bronze flecks a lot as well. The formula was decent. 2 coats was opaque enough for me. I have worn this polish many times and every time I forget how much of a pain it is to remove. It's nothing like glitter, but surprisingly hard for a foil finish.